On our self guided walking holidays in Scotland you will experience the magnificent scenery of the Highlands and the Scottish islands at your own pace. 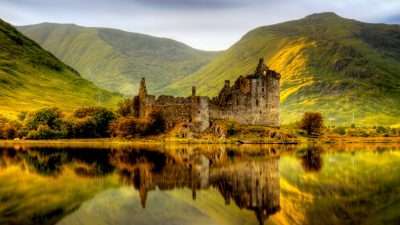 Magical mountains, unspoilt isles and tranquil lochs wait to be discovered. All of our walking holidays in Scotland include en-suite accommodation, baggage transfers on all walking days, pre-departure info pack and route notes / guidebooks, leaving you to fully immerse yourself in the walking experience. If the Skye Trail is too demanding for you, this walking holiday provides a great alternative to enjoy the spectacular scenery of Skye at a bit more leisurely pace. On this magnificent walk you will be passing by quiet beaches, deserted villages and along the remote cliff-tops of the Cuillin Mountains. Being based in Broadford and Portree, you will have a choice of hikes for each day. 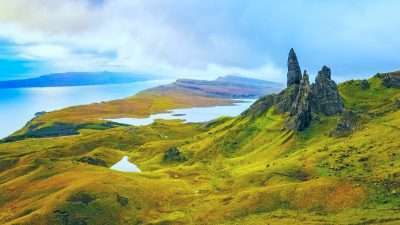 The Skye Trail is an unofficial long distance route across the stunning landscapes of the Isle of Skye, famous for its spectacular scenery, fascinating nature and rich history. 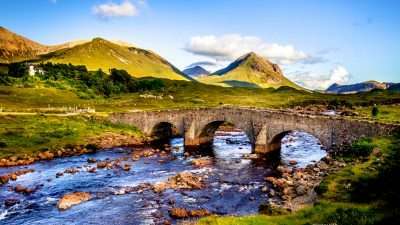 This itinerary is very demanding but rewarding; it covers most of the length of Skye and passes through the best hiking areas of the island. The West Highland Way is Scotland’s most popular long distance walking route. It stretches 96 miles (154 km) from Milngavie to Fort William, taking in some of the best scenery in Scotland. 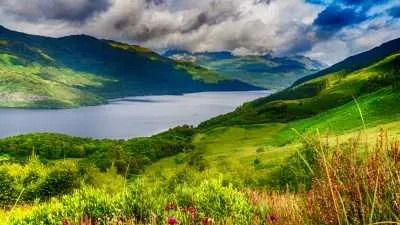 Enjoy some moderate walking along the beautiful Loch Lomond and through a highland landscape across Rannoch Moo to reach the town of Fort William. 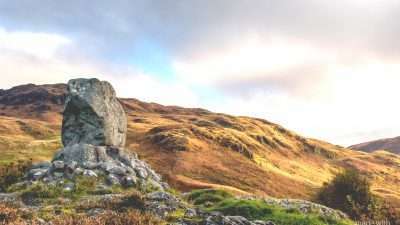 The Southern Upland Way is Scotland’s only official coast to coast long distance footpath. It runs 212 miles (340 km) from Portpatrick on the south west coast to Cockburnspath on the eastern seaboard. The Southern Upland Way West from Portpatrick to Moffat takes 10 days (9 overnights) to complete. The Southern Upland Way is Scotland’s only official coast to coast long distance footpath. It runs 212 miles (340 km) from Portpatrick on the south west coast to Cockburnspath on the eastern seaboard. Still undiscovered by many outside of the UK, it will take you through a variety of scenery and give you a tremendous sense of achievement on completion. The Southern Upland Way is Scotland’s only official coast to coast long distance footpath. It runs 212 miles (340 km) from Portpatrick on the south west coast to Cockburnspath on the eastern seaboard. The Southern Upland Way East from Moffat to Cockburnspath takes 7 nights (8 days) to complete. The Rob Roy Way retraces many of the places central to the life the famous outlaw Rob Roy, known as the Scottish Robin Hood. Starting in Drymen near Loch Lomond, the trail weaves alongside rivers and lochs until reaching the town of Pitlochry. The Scottish Highlands provide a wonderful backdrop, making this one of Scotland’s most beautiful trails. 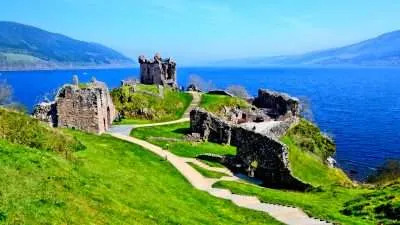 The Great Glen Way is a 75-mile (120 km) scenic walk that follows Scotland’s famous Great Glen valley from Fort William to Inverness, passing by the beautiful Loch Ness. The recently opened ‘high route’ offers fantastic views of the Highlands and down to the lochs. And be sure to keep a watchful eye out for the Loch Ness Monster! Take an epic journey through the Scottish highlands and take in the most beautiful Lochs of Scotland, including Loch Lomond and Loch Ness. 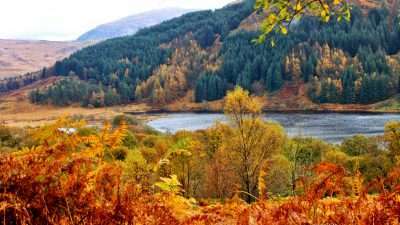 Start from Milngavie, walk by Loch Lomond and reach Inverness along the Great Glenn valley. This moderate walking itinerary takes 17 days to complete (14 walking days), covering 171 miles (275 km). Where Do our Walking Holidays in Scotland Take Place? The West Highland Way is Scotland’s most popular long distance walking route. 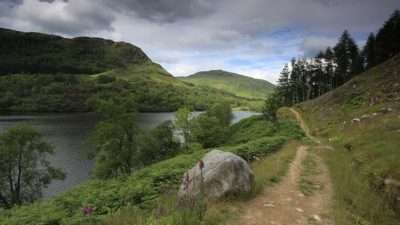 The West Highland Way stretches 96 miles (154 km) from Milngavie to Fort William, taking in a huge variety of scenery along the way, from countryside fields to loch-shores and open moorlands to rugged mountains. Normally the route is completed from south to north. 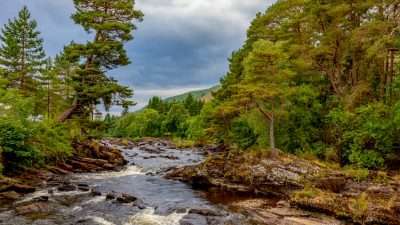 The Great Glen Way is a 75-mile (120 km) walk through Scotland’s famous Great Glen valley from Fort William to Inverness passing by the beautiful Loch Ness. The Great Glen Way is generally walked from southwest to northeast to follow the direction of the prevailing wind. The Rob Roy Way crosses the southern Highlands of Scotland taking in some of the most beautiful countryside in the UK. Starting from Drymen on the West Highland Way, it goes northeast to finish in Pitlochry. The Rob Roy Way is 77 or 94 miles – 124 or 151 km depending on the route chosen. The Southern Upland Way is Britain’s first official coast to coast long distance footpath. The full route runs 212 miles (340 km) from Portpatrick on the southwest coast of Scotland to Cockburnspath on the eastern seaboard. It offers superb and varied walking opportunities. The full Southern Upland Way provides some demanding stretches, yet some of the shorter itineraries are suitable for families and the less experienced. There are no summits above 3,000 ft (914 m), but over 80 rise above 2,000 ft (610 m), offering some fine hill walking. The Isle of Skye is known for its rugged landscapes, picturesque fishing villages and medieval castles. The largest island in the Inner Hebrides archipelago, it has an indented coastline of peninsulas and narrow lochs, radiating out from a mountainous interior. The Skye Trail is a demanding long distance walk, covering most of the length of Skye and passing through the best hiking areas of the island. Or you can opt for some less demanding coastal walks by quiet beaches, along remote cliff-tops, by deserted villages and through the heart of the Cuillin mountains. All of our self guided walking holidays in Scotland offer comfortable en-suite accommodation in nice hotels and B&Bs. Only on the Skye Trail we recommend that you have a bit more flexibility over the type of lodging (ranging from hostels to more expensive hotels and sometimes even a self catering facility) as it is very remote and there are not many options at certain locations. We have carefully hand-picked all places and regularly monitor their quality. We have tried to choose accommodations that offer friendly service, clean and comfortable rooms and local flavour. *Hotels are subject to availability. In case a particular hotel is fully booked for your desired dates we will replace it with a hotel of equal value and quality level. We will provide to you exact accommodation details upon booking confirmation. All our walking holidays in Scotland are available to start from 1 April till 30 September. The flexibility of self-guided holidays means that there are no fixed dates and you can start your holiday on any date in the season, provided that there is availability at accommodations.